The new Museum of Contemporary Art is in the Quinta de Serralves, a property comprising a large house surrounded by gardens, woods and meadows, commissioned in the 1930s to serve as a private residence and later used as an exhibition space. The museum develops a new nucleus on the grounds of an existing orchard and vegetable garden, which have now been transplanted to another area of the property, and absorbs most of the functions previously performed by the main house. The site at the edge of the garden and near an existing boundary wall was chosen due to the proximity of the main avenue, ensuring easy public access, and the absence of large trees, which otherwise would have had to be destroyed. A roughly north-south longitudinal axis serves as the framework for the project. Two asymmetrical wings branch off to the south from the main body of the museum, creating a courtyard between them, while another courtyard is formed at the northern end between the L-shaped volume of the auditorium and the public entrance atrium. The volume of the main building is divided between exhibition spaces, offices and storage, an art library and a restaurant with adjoining terrace. The auditorium and bookstore have independent entrances and may be used when the museum itself is closed. The exhibition area is composed of several rooms, connected by a large U-shaped gallery - it occupies most of the entrance level, extending to the lower floor in one of the wings. The large doors that separate the different exhibition spaces and partition walls can be used to create different routes or organize separate exhibitions simultaneously. These spaces are ventilated through horizontal openings in the false walls, while natural light is brought in through a series of skylights above suspended ceilings. As in most of Siza's buildings, the furniture and fittings were also designed by the architect, including lighting fixtures, handrails, doorknobs, and signage. Materials include hardwood floors and painted walls in gesso with marble skirting in the exhibition halls, and marble floors in the foyers and wet spaces. Exterior walls are covered with stone or stucco. These abstract and mute white walls with occasional openings, which frame unexpected views of the garden, create a minimal intrusion into the landscape, while the granite-clad base follows the variations of the ground along a slope descending by several meters from north to south. A landscaping project is currently being completed which creates a variety of new gardens in the immediate vicinity of the museum that blend into the existing park zone and help to graft the new construction to its natural surroundings. The main entrance to the museum is located at the intersection of Avenida do Marechal Gomez da Costa and Rua D.João de Castro, just south of Avenida da Boavista. This is under 2 km away from both the Office of Alvaro Siza and the Faculty of Architecture. If driving from the center of Porto along Avenida da Boavista, the main avenue connecting the city to the sea, turn left on Avenida do Marechal Gomez da Costa at the fountain, and proceed 500m to Rua D.João de Castro. The museum will be on the left side. Alternatively, from the beaches of Foz, go up Rua de Diu and then Avenida do Marechal Gomez da Costa. Buses 19, 24 and 78 travel along Avenida da Boavista. A site showing detailed bus routes and schedules is at www.stcp.pt. An excellent interactive map of the city, where it is possible to search by street name is at www.cm-porto.pt/. Click on 'Mapa da Cidade do Porto' usually in the right-hand column of the page. The museum and park are open every day except Monday, and entrance is free on Sunday mornings before 2pm. 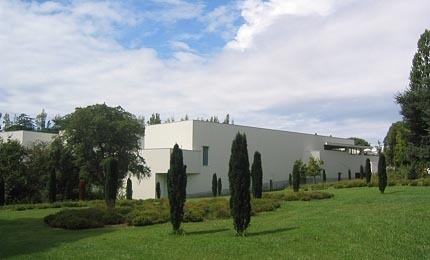 A schedule of opening hours and contacts may be found on the museum's web site at www.serralves.pt. A comprehensive volume that includes photos and drawings of all projects to date, an illuminating introduction, and several texts by the architect. A well-written, concise survey in a convenient format. www.pritzkerprize.com/siza.htm, the site of the Pritzker Prize ceremony from 1992, which includes a good biography and photos. www.cidadevirtual.pt/blau/siza.html, with several illustrated articles, a biography and project list, although outdated.